Allow squash to cool for about 10 minutes, cut in half and “gut it”, removing the seeds. Proceed to pick at the squash strands with a fork until it all looks like angel hair, or very fine spaghetti. Keep the spaghetti “shells” for reuse as a plate. Finely hop the garlic finely. Add it to 1 tbsp of EVOO and sautée lightly at medium in a sauce pan for about 2-3 minutes. Add the rest of the olive oil. Add spaghetti squash strands to garlic and olive oil mixture. Season well with salt and pepper. Return the portions to squash shells. Grill chicken and cut it into strips for ease. Add grilled chicken, add cherry tomatoes and sprinkle as much parmesan as you’d like. Return to oven to broil on high for about 2 minutes or until cheese melts. Enjoy immediately. This is a much healthier choice, and really quite delicious. It’s a light sauce that will really hit the spot, plus it is extremely easy to make. I hope you try it! 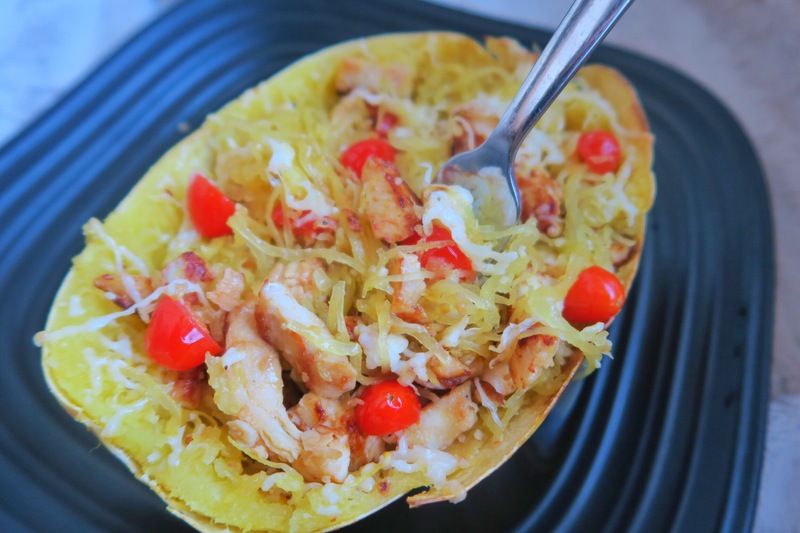 This entry was posted in Dine with me, Recipes, Uncategorized, Wine and Dine and tagged aioli spaghetti squash, healthy aioli pasta, spaghetti squash. I was suggested this website throuugh my cousin. I am now not sure whether or not this post is written through him as nobody elsee recognize such special approximately my problem. Yoou are incredible! Thankk you!